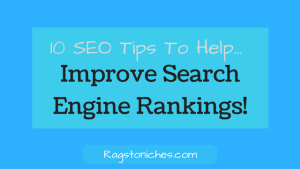 How To Improve Search Engine Rankings: 10 SEO Tips! Last updated on October 18, 2018 By Nat 2 Comments This post may contain affiliate links. We appreciate you supporting Rags To Niches! Full disclosure here. 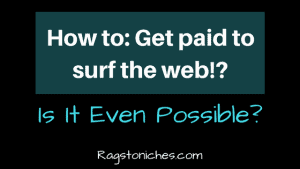 How To Make Money Surfing The Web: Is It Possible? Last updated on October 26, 2018 By Nat Leave a Comment This post may contain affiliate links. We appreciate you supporting Rags To Niches! Full disclosure here. How To Connect To Bloggers In Your Niche: The Smart Way! Last updated on December 29, 2018 By Nat 4 Comments This post may contain affiliate links. We appreciate you supporting Rags To Niches! Full disclosure here. 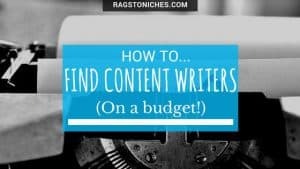 How To: Find Content Writers On A Budget! Last updated on October 6, 2018 By Nat 6 Comments This post may contain affiliate links. We appreciate you supporting Rags To Niches! Full disclosure here. How To: Make $20 A Day Online in 2019? Last updated on April 4, 2019 By Nat 4 Comments This post may contain affiliate links. We appreciate you supporting Rags To Niches! Full disclosure here.